Josef Herman was born in 1911 into a poor Jewish family from Warsaw. Between 1930 -1932 he studied at the Warsaw School of Art where he exhibited with a young group of left-wing artists called The Phrygyan Bonnet. In 1938 anti-Semitism pogroms forced him to flee Warsaw for Brussels then France and finally to the UK. He initially settled in Glasgow, where he lived from 1940 -1943 and befriended Jankel Adler, another Polish refugee artist. Herman’s early work merged childhood memories to present scenes of pre-War Warsaw, Jewish traditions and his family. Upon moving to the small mining town of Ystradgynlais in South Wales in 1944, Herman’s style shifted dramatically. He described how “Ystradgynlais changed my life and my work… Ystradgynlais mattered”. The area provided a wealth of inspiration and gave Herman an understanding of the hardships and warmth of community there – something which he so skilfully depicts in his drawings. 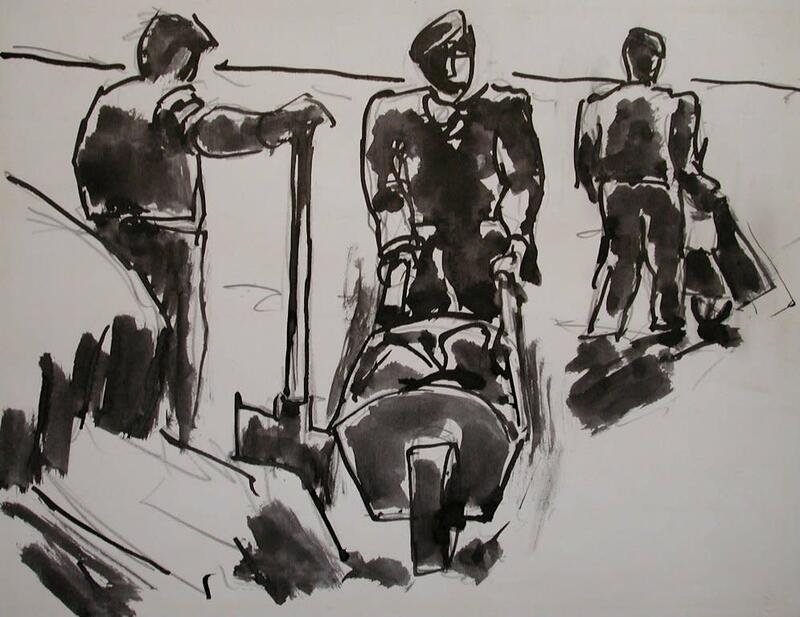 In 'Three men with wheelbarrows' of 1969, the weight of the figures is palpable. Differing from earlier works such as 'Two fishermen on deck', the bodies of these men are both sculptural and dense. The dark washes of ink and determined black lines of their silhouettes give the figures a substance that is typical of Herman’s later works. Herman has been featured in numerous group and solo exhibitions. During his lifetime large retrospectives of his works were held at Whitechapel Gallery, London (1956), Auckland City art Gallery, New Zealand (1956), National Gallery of Victoria, Melbourne (1957), Camden Arts Centre, London (1980), Royal Academy of Arts, London (1991), National Museum of Wales, Cardiff (1992) to name but a few. His works are also held in many public collections such as The British Museum, London, Manchester City Art Galleries, Scottish National Gallery of Modern Art, Edinburgh, Tate Britain, London, Museum of Fine Arts, Montreal and National Gallery, Melbourne.